The day that caps off the work week presents the first review of March, the 397th review on SuperPhillip Central to be exact. Coaster Creator 3D on the Nintendo 3DS's eShop is a game developed in part by Big John Games. If you recall, we had an interview with them. 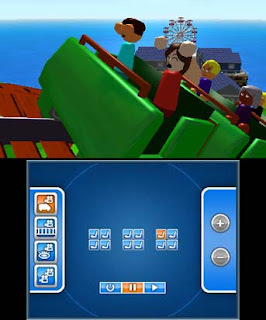 Now, we are reviewing one of their first 3DS projects with this review of Coaster Creator 3D. Let's get to it. As a tween and then later a teenager, I grew up on and adored the RollerCoaster Tycoon franchise. I loved designing my own park, situating rides, and of course building my own roller coasters. Big John Games' Coaster Creator 3D focuses heavily on the latter, as the name of the game pretty much clarifies immediately. The game is the type of ride that won't make you queasy afterwards. In fact, it's quite good. Like a well designed roller coaster, let's lay out the groundwork as to why. Jumping right into coasting creation is an arduous task, so the designers of the game have a Career mode, built up of twenty or so challenges, and hosted by famed fictitious and retired roller coaster designer Gill McGee. Each challenge introduces you to core concepts concerning how to create coasters. Each challenge also has its own limitations on what you can do and what tools you can use. You are never building a coaster from scratch in the early stages; You are merely tweaking preexisting designs. Some challenges only allow you to twist the track, while others only allow you to add loops or corkscrews. Depending on the challenge, there are different objectives to complete. 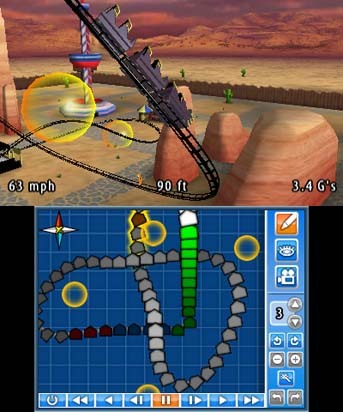 Many challenges require you to make it so not only the carts reach the end of the track, but the carts pass through all of the targets (performed by tweaking the track to lead the carts to said targets). Other challenges have it so your cart reaches the required speeds, doesn't jerk its riders around, or have it where you need to have your cart's riders rise from their seats on various hills. After your work is done, you can test your tinkered with ride out. Thankfully, the game does not punish you for failure. You can try as many times as you like to get it right without penalty. your track must lead the carts into. While you can jump straight into Coaster Creator 3D's Sandbox mode right when you begin the game for the first time, completing challenges in Career mode is the means to unlock new track styles, cart styles, and much more. This may turn off some players who just want to start designing their own coasters freely with all of the options available to them. Nonetheless, making a coaster is very easy. 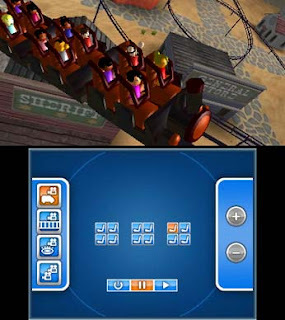 You have an overhead view, and you place the start of the ride (the loading area) on the map. Then you draw the desired path of your coaster, making sure it connects back to the ride's start to make a complete circuit. You only have a limited amount of distance a coaster can be. Once you are satisfied with the drawing of your coaster, you get transported to the 3D creator where you can edit your placed track, making loops, corkscrews, twists, etc. and create hills. You can also place objects, whether themed or generic, that add some eye candy to your coaster's surroundings. Speaking of eye candy, you can customize the colors and design of your coaster and carts to make them visually attractive rather than just fun to ride. perspectives on each coaster you create. Editing coasters takes some getting used to. You select pieces of the track to edit that specific part. The bottom screen shows the layout of the track (you shift perspectives with the directional pad) while the top screen shows a 3D version of the track. With the bottom screen you use the stylus to move the track around. Depending on the viewpoint, you are either moving track pieces left to right or up and down. Learning to use both perspectives is paramount to understanding how to create coasters well. join you on your wild ride. 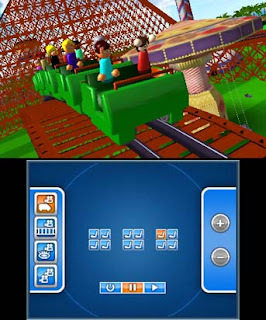 Coaster Creator 3D is a wild ride made by people you know are ardent roller coaster enthusiasts. While there are some issues with the game (for one, I've had the game crash on me, resulting my Nintendo 3DS needing to auto-restart), the package as a whole is well done. Sure, the game has its ups and downs like many roller coasters do, but the final product is definitely worth the price of admission.